Speaking of Mother’s Day, please watch your email on May 11. I’m sending out a special gift for home stagers with my best tips for juggling family life with your own business. I hope the men in our Staging Diva community will forgive this focus on Mother’s Day. You may be a parent (or have other demands on your time) and you’ll find the tips helpful too. 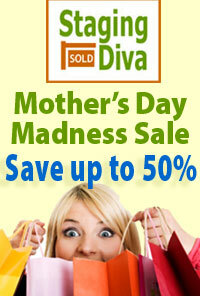 In this month’s articles you’ll learn more about the Mother’s Day Madness Sale on now through May 13. You’ll also learn whether it’s always necessary to set a table for home staging, and tips for doing it right. Plus, I’m sharing a fabulous home office/family room makeover by Staging Diva Grad Lori Fischer. You’ll meet Staging Diva Grad Stacy Goade who has to be THE home staging expert in Alaska. She did an awesome job appearing on CBS news, wait until you see the video. 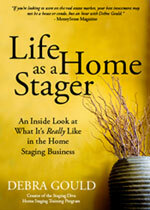 To read all these great articles for home stagers click here. Recently, I’ve received many inquiries from aspiring home stagers wondering whether they have to pay an ongoing licencing fee to Staging Diva after Graduation. While this may be a common practice with other training companies, it’s not something I believe in. Once you’re a Staging Diva Graduate, I’ll continue to support your business and promote you wherever I can. There is no fee to do this, it’s actually my joy and honor! More on this topic in this month’s articles. There are two opportunities for you to spend an evening with me on the phone talking about staging this month. I hope you’ll join us! Happy Mother’s Day and enjoy the staging season!